Guided field trips are held 15-20 times a year, usually September through April. They are typically day trips to local birding trails in Citrus County or surrounding areas. Occasionally, a two-day trip is offered to a birding hot spot in another part of the state. All levels of birders and nature photographers from amateur to advanced take part in these outdoor activities. 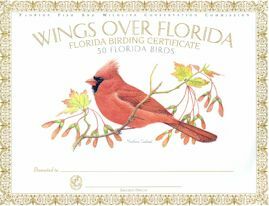 Wings Over Florida is a FREE award program open to resident and non-resident Florida birdwatchers. Its purpose is to encourage YOU to identify as many native birds as you can within Florida.